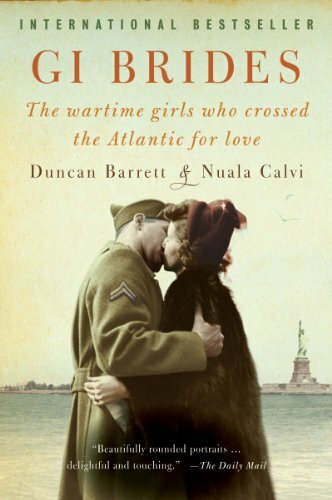 For December Book lover’s Never go To Bed Alone, Again read GI Brides by Duncan Barrett and Nuala Calvi, we received free copies of this book from the publisher through their The Book Club Girls program. I went into our discussion wondering, What are we going to talk about with this book? and I could not find any discussion questions to fall back on, I would just have to wing it with the few basic questions I had come up with. We started our discussion as usual, going around and hearing everyone’s impressions of the book. The opinions were varied, from hating it to really enjoying it. Some of the criticisms were that it was poorly written, had no depth, seemed to be romanticized and the individual stories were hard to keep track of (some women read it by reading one bride’s story at a time and then reading the next brides story). On the positive side it did show us a different point of view, it was an interesting topic which we had not known much about, and the stories could be viewed as very poignant. The discussion ended up being one of our best. We talked about why the author chose the brides they did, which brides we liked (Rae seemed to be the overall favorite), which we didn’t, the effects the young age of the brides had on their stories, the choice to format it the way the authors did and why, the choices the brides had, why they wanted to be married and come to the US, and would we want to hear the GI’s point of view. Sometimes the books don’t have to be great literature and we don’t all have to enjoy them to have a great discussion!